Can Anyone identify this phonograph ? Post subject: Can Anyone identify this phonograph ? This is a very distinctive machine,especially the reproducer! Anyone know the make ? Post subject: Re: Can Anyone identify this phonograph ? Could you share a few more photos, including some of the reproducer? sorry, it's not mine - this is the best I can get. I don't know what it is either, but I don't think it's a Pathé. 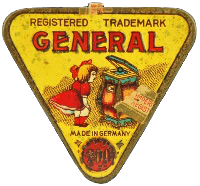 Judging solely upon appearance and the design of the carriage and reproducer, it looks German to me. Just a guess, but Pathé machines are usually more artistic than functional. thanks for that so i can correct my archive!